Participate in Kyne's Sacred Trials by hunting the guardian beasts of Skyrim. 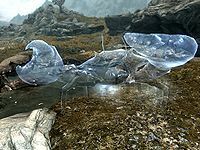 Defeat the Guardian Mudcrab, Guardian Skeever and Guardian Wolf. Defeat the Guardian Bear, Guardian Mammoth and Guardian Sabre Cat. Visit Froki's Shack and speak to Froki, a hunter. He will lament the worship of the Divines and pine over the old Nordic traditions that honor Kyne. If you agree, he'll grant you a blessing to seek out the guardian beasts of Skyrim and perform the Sacred Trials of Kyne. All the guardian beasts are unseen until you engage in the quest and inhabit areas populated by normal creatures of their same species. You'll have to go out and hunt the lesser beasts first before he gives you the set of greater beasts to hunt. The final trial is to hunt and kill Kyne's troll champion. If you struggled with the guardian mammoth, this part is potentially even more difficult. The troll spirit is inside Graywinter Watch and will almost immediately attack alongside two other normal trolls making this a tough fight for lower level players. It is a very small cave and if you sneak on entering, all three can be picked off from the entrance (fire bow recommended). Any sort of fire damage is useful on all the creatures involved in this quest, especially the trolls. Two dead bandits have minor loot, alongside Froki's bow (on a barrel). Froki will reward you with Kyne's Token upon completion of the quest. You can use the Animal Allegiance shout on all the guardians, thus making them stand there while you kill them. You can find Froki's bow inside Graywinter Watch. He'll allow you to keep it if you tell him you found it. A fairy circle of white caps with a copy of Father Of The Niben and a random staff laying in it. A shrine of Akatosh with a copy of Tragedy in Black at its base. From the guardian sabre cat follow the face of the ice wall north. A chest and a copy of 2920, Rain's Hand, v4 can be found in a small alcove. Difficulty for this quest is based on the ability to kill a mammoth. If you're able to kill one in open combat you should be able to handle this quest. Alternatively, the mammoth can be killed by ranged attacks from the hill to the north. If you decline this quest, Froki will not offer it to you again, but the decline option remains in your dialogue choices. If you back out before Froki offers the quest, it is as if you declined the quest. Running "setstage dunHunterQST 21" should allow you to do the quest if you are in this situation. If you own Lakeview Manor, on your return it may be attacked by bandits, which can engage in combat and kill Guardian Wolf and his pack. Still, the quest will progress as normal. When asking Froki "What should I do now" after being assigned to hunt the guardian troll, his response may loop indefinitely. Exiting the conversation breaks the loop. If you don't mention finding his bow before informing him you killed the Guardian Troll, there is no dialogue about it. Froki's Bow respawns, making it possible to own multiple copies of this unique weapon. 20 I met an old Nord named Froki who offered to guide me through the Sacred Trials of Kyne. 21 I met an old Nord hunter named Froki who told me about Kyne's Sacred Trials. He has marked me so that the guardian skeever, wolf and mudcrab should appear to me when I visit their lairs. 50 I met a hunter named Froki who sent me on Kyne's Sacred Trials. I have defeated the first three guardian beasts as instructed. 51 The Nord hunter Froki is guiding me through the Sacred Trials of Kyne. I defeated the first group of guardians and have been tasked to seek out the guardian bear, sabrecat and mammoth spirits. 70 The Nord hunter Froki is guiding me through Kyne's Sacred Trials. I have defeated several guardian spirits as instructed. 71 The Nord hunter Froki is guiding me through the Sacred Trials of Kyne. I have defeated several spirit guardians and have now been asked to seek out the Troll guardian as my final challenge. 80 The Nord hunter Froki guided me through the Sacred Trials of Kyne. I have defeated the final guardian, a troll spirit. 100 Finishes quest The Nord hunter Froki is guiding me through the Sacred Trials of Kyne. I had to defeat the guardian spirits of many beasts, and was rewarded with the Blessing of Kyne. The following empty quest stages were omitted from the table: 10, 15, 30, 31, 32, 60, 61, 62. On the PC, it is possible to use the console to advance through the quest by entering setstage dunHunterQST stage, where stage is the number of the stage you wish to complete. It is not possible to un-complete (i.e. go back) quest stages, but it is possible to clear all stages of the quest using resetquest dunHunterQST. This page was last modified on 6 September 2018, at 03:24.